The first impressions I had of the Vigilant Trails Survival Fire Kit were curiosity and hopefulness. Curiosity of what could possibly be inside and what would set it apart from other kits. Hopefulness because I’ve been searching for a small kit that had everything I considered important. Since the container was round, it had me wondering what could be the same shape and used for creating fire. That piece is the parabolic-solar fire starter. It’s a piece of gear that is rare in other retail kits. It’s also an item that sets this kit apart from a majority of most others. The other pieces that make this kit unique are simply the variety of fire starting materials, two candles, and 6 feet of paracord, plus a wire-saw that is decent quality. So, let’s get to the contents. Here is what the tin looks like when you first open it up. As you can see, the various materials that can be used to make a fire are pretty darn good. The burlap “pads”, cotton balls (w/petroleum jelly), and tinder tabs should hold you for quite a few days in the wild. I particularly like the pieces of burlap. The wire saw is better than most that you see for sale all over the place. The grips make it easy to use, even with gloved hands. You won’t be able to cut down a Redwood tree with the wire saw, but you’ll certainly be able to gnaw off some small branches for tinder. I haven’t seen sections of burlap or a wire saw in any run of the mill kits. It is a nice touch that Vigilant Trails seems to put into everything they make. Would you like to start a fire with matches or sparks? Well, you’ll be happy to know that this tin contains both types. Of course you have the parabolic reflector w/an attached arm that can be pushed into the upright position so you can attach some sort of tinder. There is the muslin, pull string bag that keeps the reflector from getting scratched up. You have two different flints with steel scrapers. One is normal for fire kits and the other has a bar of magnesium whose shavings can get some tinder fired up. Not fond of those? That’s OK because you have 10 waterproof/windproof matches w/striker, 2 matchbooks, and even a Fresnel lens. You’ll need the sun to use the parabolic reflector and Fresnel lens, of course, but you have plenty of backup if the skies are gray. *Variety of materials is an A+. *Cost is relatively inexpensive for what you receive. *Easily added to your BOB, car, or EDC bag. *Container is definitely not crush-proof. *Not much grip to open the container if wearing gloves. *Items are packed so tight, there is zero room to add your own bits, unless you remove items, which is counter productive. You can find the Vigilant Trails Survival Fire Kit here on Amazon for about $27.00. 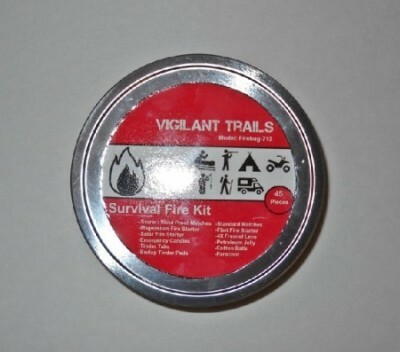 You can also visit the Vigilant Trails website and see all the great kits they’ve put together.